This new recital disc from violinist Simon Smith on the Resonus Classics label pairs works for unaccompanied violin by two major 20th century Hungarian composers. 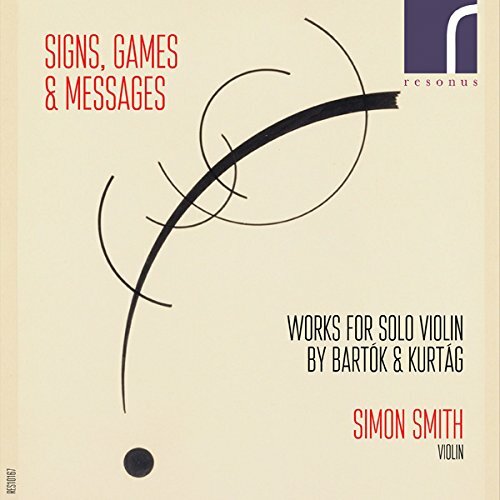 Smith plays Bela Bartók's Sonata for Solo Violin, Sz 117 and György Kurtág's Signs Games and Messages. Kurtág's music is known for its concision, tendency to aphorism and concentration on small gestures. Starting from the 1970s he wrote a series of short pieces, collectively called Jatekok (Games), for a variety of instruments. From the 1980s onwards he wrote Signs, Games and Messages for solo violin. The 18 short pieces (the shortest lasting around 45 seconds, the longest nearly 5 minutes with the majority at around a minute) provide a remarkable digest of Kurtág's art. Though short, each is concentrated and Smith's performances bring out the intensity of the gestures. The opening Perpetuum mobile (one of three in the set) does wonders with the violin's opening strings, whilst the second movement builds something striking from a simple sequence of semi-tones. Many of the works have personal connections or other links. Hommage a J.S.B is notable for the elegance and clarity of Kurtág's inspiration based on Bach, whilst Hommage a John Cage is austere and rather equivocal, the violin seemingly unsure or unable to achieve its goal. In memoriam Blum Tamas is notable for its slow intensity and anguished harmony. The programme booklet does not elucidate or translate all the titles. féerie d'automne evokes just that with delicate, evocative wisps, but with movements like Népdalféle we are left to apply our own imagination to the intense, melancholy music. All is not melancholy however, the Carenza Jig (written for an eight year old girl named Carenza) is a joyful delight, both this and In Nomine - all'ongherese bring out the Hungarian aspects of Kurtág's music despite the In Nomine being inspired by John Dowland. The final movement Antifona Hirominak was written for the violinist Hiromi Kikuchi, and the work forms a strong ending to a remarkable sequence. Short and aphoristic though they may be, the movements are full of character, even though Kurtág's music lacks the sense of wit and twinkle in the eye that you sometimes get from his friend Ligeti, Simon Smith brings out the intense detail in each one, making the complete sequence a striking whole. Bartók's Sonata for Solo Violin is in complete contrast. It was commissioned by Yehudi Menuhin in 1943 in an attempt to help support the composer during his time in America, a period when Bartók was already ill. Menuhin performed the work in the composer's presence at the Carnegie Hall in New York in 1944. In four substantial movements, the piece is a significant challenge to violinists. Smith brings out the Bachian influences in the opening Tempo di ciaccona, managing to combine searing intensity with beauty of tone. The second movement Fuga shows just what can be achieved contrapuntally on the violin. It is an uncompromising, almost violent movement with a strong sense of Hungarian music in the melodic material and Smith brings a wonderfully sustained sense of power to it. The third movement Melodia returns to Bartók's more lyrical mode, evoking something of the night music which he was known for. Smith plays with a lovely melodic, mellow tone which belies the intensity of his performance. The final movements of Melodia evaporate evocatively into nothing before the furious energy of the final Presto takes over. This starts quietly but insistently and develops a furious dance-like energy.